Lenovo K3 is one of the newest Android device or phone now, although it was released December 2014. One good thing you need to do to any Android phone to be able to perform extra-ordinary function, unlike how it was configured to work by the producers, is to root the phone. In one of my previous post, I explained it very well on what rooting of phone is all about and the benefit behind rooting your device or phone. Please read: Meaning Of Rooting Android Phone And The Benefits Of Rooting and How To Root Andriod Device And The Reason WhyYou Need To, before you continue. 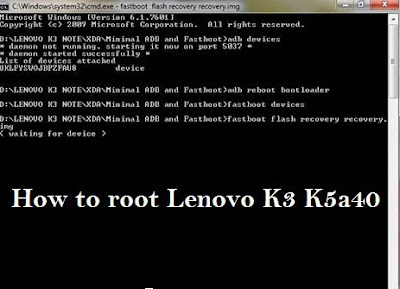 If you have Lenovo K3 device/phone or you wish to root the device but don’t know how to do it or maybe you afraid that rooting the device may affect its functionality and damage the phone for no further use. In this post, you will learn how to root Lenovo K3 device/phone without losing your data. Things you need to know before you begin rooting your Lenovo phone. What is KingRoot: KingRoot is a powerful tool that allows an Android phone to be rooted successfully without any issues. It performs the rooting process quickly and effectively. With the help of this method of rooting, you don’t need to worry about taking backup of your data and contacts as those will not be affected whatsoever by this process. However, you should still take a backup before you begin this process. 1: Open the settings of your Lenovo K3 Device/phone and then go to security. From there you will go to Device Administration and Unknown Source. You need to tick it to enable it. 3. Once the download and installation are done, you will see an icon of KingRoot on your device. 4. Now tap on the Kingroot launcher to open it. When the application will launch, you will see a Start Root option on the bottom. 5. After you click on the Start Root button, within a minute, you will be able to see a Big Green Root Button that will signify you that the rooting has been done successfully. 6. Restart the device/phone, you will be able to see you Lenovo K3 device the way it was at the beginning. Now if you wish to know if your phone has been rooted successfully, then you can download and install Root checker Application from Google Play Store and verify the status of your root. If you follow up this post very well, you will know how to root Lenovo K3 device without any difficulty. The best thing about this process is it can be done with any Android device as well. However, before you start this rooting process, there are few things that you should take care of. After the root, you can install the new version of Android on your phone with all new applications that weren’t possible with the earlier version of Android, which I will share here in my subsequent post.